I like Oprah. I didn't know folks hated her. Great piece. Just one quibble, I think you mean ego-bruised, not id-bruised. If Oprah was all Id it would be a whole other show! Andy you have no idea what you are talking about. You are a leftist blogger that is attacking Oprah because she did her job and interviewed Palin. 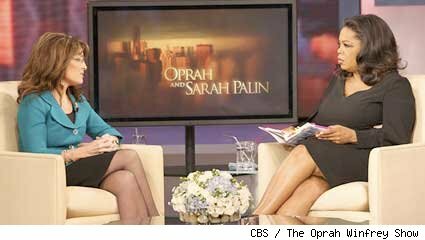 Oprah did not make anything about her she handled herself well and cleared the air that contrary to mass media reports Palin was not snubbed. You just need something negative to say or you cannot be happy. Way to cut through the BS of this non-event. Oprah invites Palin on her show to promote Sarah's ghost written memoirs. This interview was all about ego and the sad state of feminism in America today. We'll know when we've finally turned the corner on sexism in the U.S. when a female candidate is nominated for president/vp and nobody comments on her looks, style, or devotion to family. In the case of an unqualified Palin, there was little else to discuss. Palin's new talk show should fill the gap between Oprah and Jerry Springer quite nicely.